For this Raptor project, I focused a lot on the eyes of our raptors. 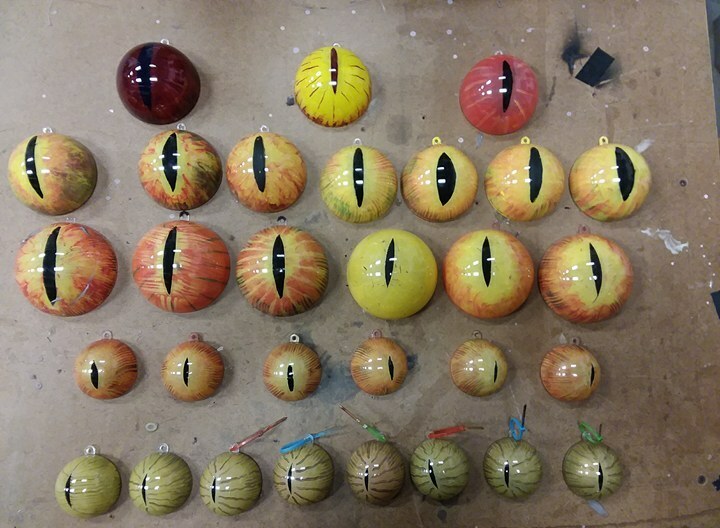 When making creatures, the eyes are what define the personality of the creature. The eyes set to whole mood and tone of how the audience will perceive your creature. An added challenge for the raptors was also needing to have lights shine through the eyes. This was accomplished using clear plastic ornaments and acrylic paint. When working with acrylic paint, it is important to remember that three passes of acrylic blocks all light. One thing I discovered is that when painting so thinly with acrylic and also having light shine through, every single brush stroke is immediately visible. Even if it is not visible as you look at it, the back lighting reveals everything. The eyes also required backwards painting, meaning that I had to start with the pupils then move to eye details and then finish with the base color. This requires a lot of forethought and does not allow for small touch ups or finishing touches after the initial painting. This style of painting requires a large amount of prototyping and sampling. You need to figure out what details in the eye you want visible and how strong they will be, what colors work best on top of each other, and what brush strokes look best with the light. This is the longest part of the process. There are an infinite number of possible arrangements of details and intricacies. For the raptors, my process for the final product boiled down to five steps. First, I rolled out a few strips of electrical tape onto come sort of plastic scrap surface, then I used an exacto blade to cut the shape of the pupils. Originally I tried to make a template, but it proved to be difficult to make nicely curved cuts with a template in place. So I decided to free hand my cuts and then select the best looking and most consistent cuts. Second, I did a fine layer of metallic gold spray paint. This step was the trickiest because I was worried about laying on too much spray paint. I discovered that the metallic paint had an odd effect of looking solid at first glance, but then allowing a large amount of visibility when held up. The third step was carefully painting on all of the line work that appears in most eyes. This step technically has two parts. 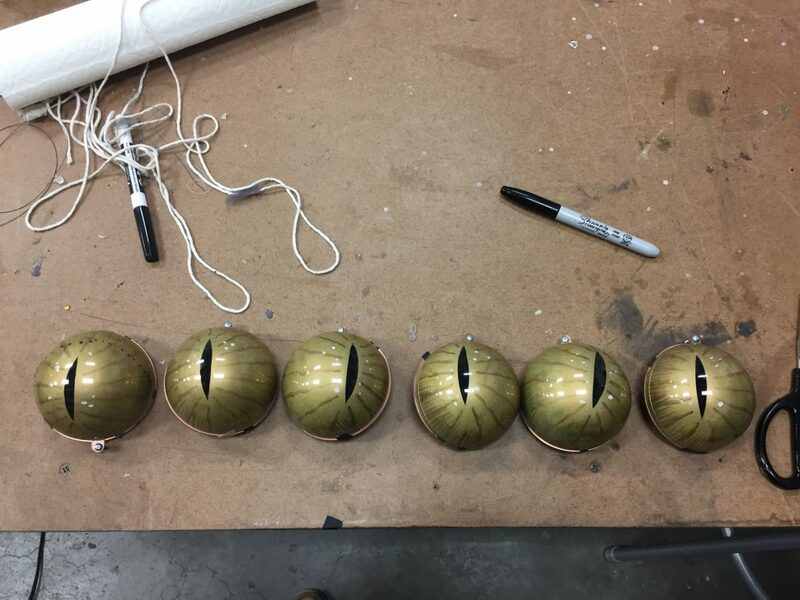 The first part is paint on each individual line radiating out from the pupil. The second part is adding striations coming down from the sides. This was achieved by taking a small fan brush, dripping it in water, and then brushing off the water until the fan brush divides into small sections that can be used to draw thin lines. Step four was the most enjoyable step because the best method I found for applying this layer of outer detail was by using my finger to smudge on a gradient color to the outer rim of the eye. I chose this method because this was the best way I found to hide my brush strokes and create a natural and organic feeling in the eye. The final step is to add on the final base layer by stroking out from the center of the pupil. This allows your brush strokes to add a pleasant texture to the eyes while also keeping paint from getting underneath the pupil. All that is left to finish the eyes if for lights to be attached to the back and plugged in!